Three species of owl live in this patch of rainforest. Barking owls (Ninox connivens) —named for their calls and possibly their demeanour — sound like a small terrier that is stuck up a tree, but is not especially distressed by its predicament. The two syllable woof woof is so pooch-like that it sets off the local dogs. If you need to find out how many hounds are in your neighbourhood, get a barking owl. 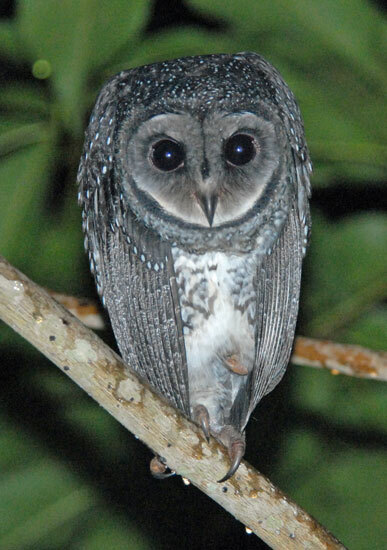 Southern boobooks* (Ninox novaeseelandiae) are the most abundant owls in Australia. When I lived in Townsville, I saw them regularly, but I have yet to spot one at this place. I hear them all the time. Like barking owls, they have a two syllable call. Unlike barking owls, their call is quite restful. Not that I’d make a sleep tape of boobook calls, but there are worse sounds in the rainforest. Which brings us to the species that I’m most likely to see at this place — the lesser sooty owl (Tyto multipunctatus). 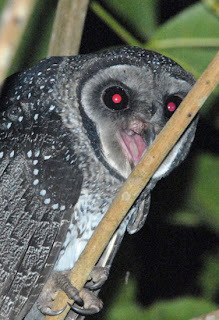 Beautiful plumage, the lesser sooty owl, but a call like a falling bomb or a hideous scream, depending on distance. For the past few months, the owls have been hanging around the house. I think they are making the most of the cicadas and beetles attracted to the lights. Several times, they’ve flown past and given me a heck of a surprise. Even the microbats make more noise when they zip by. *If you’re unfamiliar with the boobook in its natural surroundings, you might know it from its unnatural ones — perched on the heraldic crest of Ankh Morpork** or Sir Terry Pratchett's coat of arms. **An alternative common name for this owl is morepork***, derived from the transliteration of its call. Wow! These are such super photos. I'm so jealous. I saw a Sooty Owl near Toowoomba in 1991 and have never seen a Lesser Sooty Owl. It looks so beautiful. Talking about Boobooks also makes me homesick. Theres is nothing richer in life than listening to their calls in the dead of night. Isn't it a handsome owl! The tree it's sitting in is about 5m from the living room, so I got a good view of it. Boobook calls are lovely. The main night sounds here are boobooks interspersed with scrubfowl (not so melodic! ), cicadas and the odd cow. OOOooooooohhhh!!!!!! that IS the cutest owl!! it looks like a cartoon character!! the 'dropping of the bomb' sound made me duck & cover my head! did you find yourself dropping & rolling when you heard them around your house for the first time??!! very cool little owl...and so is the link site! Wonderful photos, Snail. I hear them here in Kuranda but have never seen one. But then, I'm looking down most of the time! Justin --- you're right! Wouldn't it be wonderful to have a whole set of local owl species done like that? The first time I heard the call from a distance, I thought someone had let off fireworks. The first time I heard it from about 3 m away, I thought the hounds of hell were about to descend. Dave, most of the interesting action is down near/on the ground! Mind you, I did almost tread on an owl the other day. It had swooped down --- silently --- to pick up a cicada and was so intent on its meal that it didn't see me until I was quite close. We both got a bit of a fright, I think. The kelpie here in SW answers both the chimes of the morpork and the bark of the barking owl, but no other bird calls, including any 2-tone parrots of similar volume. He used to also fuss about introduced kookaburras until I told him they were none of his business. 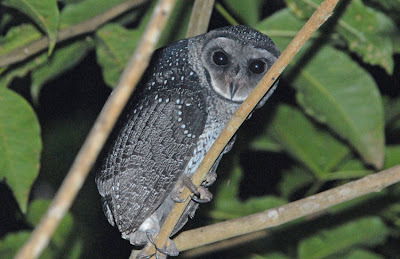 Beautiful Sooty Owl photos - we hear them call (sometimes quite close to the house) but have only seen them occasionally during our 'toading' expeditions. Sorry, Anon (D?) --- your comments went into the damned spam filter. I don't know why. I wonder if your owls have a different accent to ours? I can't add anything else, except to offer a bit of misdirection...When I go to Townsville, I stay at a friend's place next to a park. On some mornings, a group of people go to the park to engage in laughter yoga...and set off the kookaburras. The kookas usually win. I had seen that vid before, but it's always worth a look! Strange how your "common Owl" seems so exotic to we southerners. Barb & Allen, a few species seem to be a bit bolder on the Tablelands. It might be the lower temperature! Denis, They're really rather remarkable owls. I think of them as being quite exotic too. I also feel terribly privileged that I can photograph them from the living room window. How good is that?! Merry Xmas and Happy 2012 to you, too, Magda. If there's even the merest possibility of a Discworld reference, I'll shoehorn it in! Lovely owls - in Māori, the morepork is called the ruru (sort of roll the r ). I like your sooty owl - nicely demonic. They do a good line in demonic, but mostly I think they sit in the Melicope and watch ABC iView through the window. Thanks for those lovely links. That second one in particular has lots of info. And now I am trying to engineer a situation in which a greeting of 'My gift is one of owls' is entirely appropriate.